Your sessions were well tailored to suit this and to different learning styles. We wanted the day to be fun and it certainly was. And yet at the same time we achieved our more serious intention of building our knowledge, attitudes, awareness and behaviors to take this excellent team forward together. Todd is doing some amazing training with our staff. If you need an endorsement for him, he’s worth every penny! We had him produce two curriculums and 2 trainings for our coaches/ staff team and every time he does them, the staff want to know when the next one is!! Excellent start on this journey for the team- hope we can continue to work together – I do like this training workshop especially, teaching us by using experiences and games – The workshop today is very valuable because it teaches us about building a strong team and good relationships – This is an excellent workshop for our organization. - This training helps bring us closer – This training is very useful for our bank – I highly appreciate the session as you have embedded the thoughts in the minds of our staff and this will keep them thinking – This training helps us know the value of each other and to forgive each other – Helps us to cooperate with one another to strengthen and build our reputation to become a stronger organisation – the staff have learnt some important lessons from you and your team – I like all activities in the workshop. I hope next time we will have more fun. Thank you!! Todd and his team came up with, as he calls it, several waves of activity where our team engaged in interactive workshops, 1–1 coaching and small group case studies, driving each individual to take ownership of their leadership style and delivery and committing to becoming better than they were yesterday. At this point in time we are taking Ripple’s high energy, engaging style of learning and running with it, even after our programs concluded. We want to create the great leaders of tomorrow inside our company. 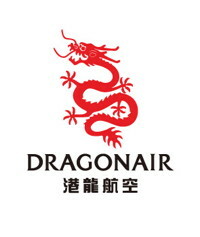 Cathay Pacific Airways/DRAGONAIR highly recommends Todd’s training tools and delivery and can confirm the aspects of the Ripple Effect are alive and well inside our Cambodian team environment. 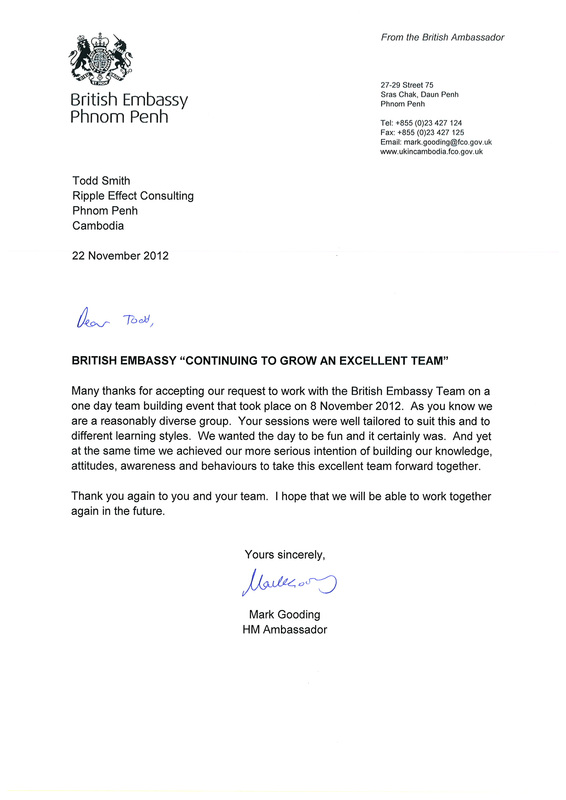 Many thanks for accepting our request to work with the British Embassy Team on a one day team building event that took place on 8 November 2012. As you know we are reasonably diverse group. Your sessions were well tailored to suit this and to different learning styles. We wanted the day to be fun and it certainly was. And yet at the same time we achieved our more serious intention of building our knowledge, attitudes, awareness and behaviors to take this excellent team forward together. Todd Smith and Ripple Effect Consulting supported a recent retreat sponsored by a program Social Impact manages. Our program was engaged to provide a two-day retreat to a team within USAID’s Cambodia Mission to improve teamwork and collaboration, strengthen and clarify organization structure and roles, and improve communication and morale. It was a tall order to be completed in a very short time frame. Todd and Ripple Effect not only supported our US-based consultant in identifying and establishing an agreement with a local venue, but also provided logistical and administrative support. Most importantly, Todd was able to work with our facilitator to design and deliver a two-day retreat which involved a large number of objectives, included difficult material for the group to address, specific outcomes that needed to be achieved, and at the same time create an energizing, morale-building experience for the group. The team was excited to apply the outcomes of their work and enjoyed being together and working on team activities. In addition to the outcomes for the team participating in the retreat, we at Social Impact were very pleased to work with Ripple Effect Consulting. Todd is flexible and easy to work with, and very focused on getting the job done well. We will certainly look for ways to use Ripple Effect and engage Todd Smith in the future. I liked the way the training program was structured, combining workshops, small groups, individual coaching, and social events in three successive waves over a five-month period. Using multiple methods to present and reinforce concepts over an extended period helped to embed new ideas into our mind set, language, and practice. I liked that the training program promoted a mature approach to management and leadership. Participants were encouraged to develop their strength of character, accept responsibility, and focus on performance improvement. I also liked the flexibility that you and your team showed in customizing the training content to our needs. We worked together to adapt the training topics in each new wave based on experience gained in the preceding wave. In addition to the new ideas and skills gained by each participant, a major outcome of the training for iDE has been a move to incorporate a more systematic approach to “staff coaching” within our organization. This is the second time that we have used Ripple Effect services. Both times, we have been very satisfied with the quality and creativity of your work and the personal attention that we received. I have no hesitation in recommending your services to other organizations. Mr. Todd is an active, creative and innovative trainer. All of the staff at Roomchang very much appreciated the quality of the training course as well as his ability and professional work ethic. I would strongly recommend Mr. Todd Smith as a consultant/trainer. Our intention is to build our staff capacity and communication skills and we would not hesitate to contract him again in the near future. We were truly impressed by the quality of both curriculum as well as Todd’s work ethic. He deserves full credit for the concepts of the lessons and the design of the programme, most of which were his own ideas. I strongly believe that his ability to understand what we were looking for and to take charge of the programme was what ensured the quality finished product In addition to the curriculum, Todd was responsible for teaching the coaches the Leadership Training programme as well as teaching our staff. Both workshops were fun, interactive and extremely professional. Seeing our coaches teach the lessons to the children afterward confirmed the success of both the curriculum and the workshops. This reinforced our belief that we made the right decision in contracting Todd for this job. I would strongly recommend Todd as a consultant / trainer. Our intention is to expand the above programme in the near future and we would not hesitate to hire him again. From the outset, Todd was entirely professional in his approach and made it his priority to become familiar with PFC projects and organizational methodology. At all times he ensured that proposed activities and training was in line with our requirements and expectations. During the training and facilitation we found Todd to be an excellent communicator in both Khmer and English language. PFC staff feedback was very positive with one man stating that he learned more in one morning with Todd than he did in one whole week with another training provider on the same subject. Todd was generous with his time and from the output we received from him it is obvious he donated many hours of his own time in presenting excellent work. I recommend Todd to anyone considering him for organizational development, training and evaluation and would seek his services again for similar activities in the future. Todd Smith took on the job and over a very short period of time developed an interactive, creative and fun program specifically designed for football coaches in Cambodia. The quality of the material is best seen in all the examples relating to Cambodian culture and language, showing that Todd has mastered the language and understands the way young Khmer think. Despite a tight budget, I think hiring the expertise of Mr. Smith will make a big difference in our project and I am looking forward to keep working with him on further projects. Due to circumstances beyond our control, ChildFund Cambodia required the services of a leadership and management training institution for eleven senior and middle management persons, with only five days notice. Ripple Effect Consulting, led by Mr Todd Smith, undertook the training. Even with a limited time for planning, the training agenda was tailored to the specifications of the organisation and the personnel participating (all but one were Khmer nationals), with some flexibility for change in the agenda as issues might arise. The training was interactive, fun, motivational and an excellent learning experience for all persons.